Brass, marble, and Lucite blend beautifully in a Wellesley home. The kitchen of this Wellesley home functioned perfectly well, but it didn’t suit the owners’ taste. 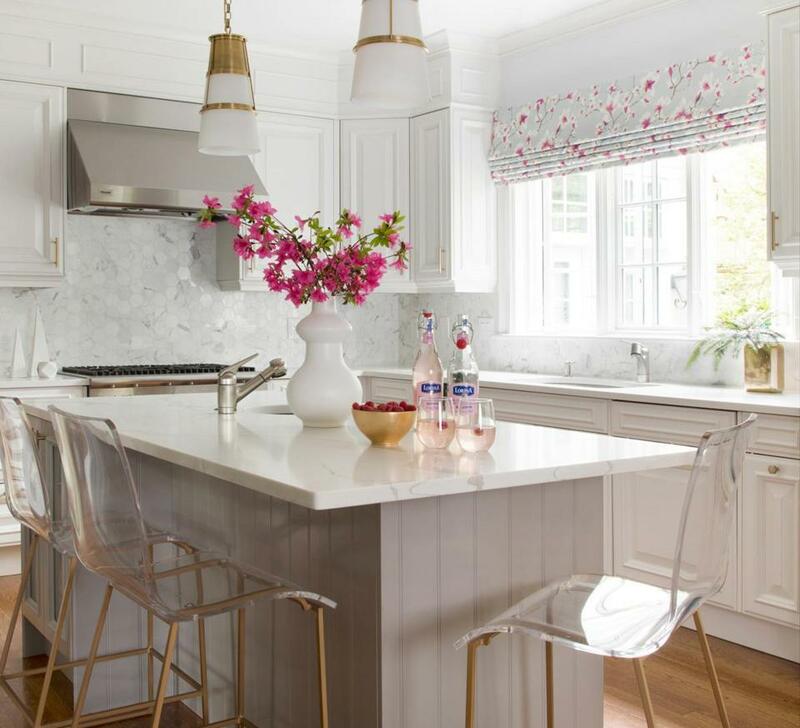 “The wife really wanted a white kitchen,” says Deborah Berger, founder of Maven Interior Design. To make the room feel fresh but not stark, Berger added panels to extend the upper cabinets to the ceiling, repainted the cherry finish, replaced the dark granite countertops with crisp white quartzite, and upgraded the backsplash. She also reworked the center island to eliminate bulky legs, topping the newly streamlined base with a quartzite Calacatta marble look-alike. 3. Although Berger initially envisioned large lanterns, she chose Robinson pendant lights by Thomas O’Brien for Visual Comfort with a hand-rubbed antique brass finish. “These are on the smaller side but have a lot of look,” she says. 4. Roman shades in a flowering magnolia print by Romo Black Edition add a feminine touch without seeming too sweet. “The slightly burned-out digital rendering even makes it a bit edgy,” Berger says. 6. Clear acrylic counter stools by Gabby Home met the requirements of both client and designer — they have backs for comfort yet are still light and airy. “The gold frame tied together the design,” says Berger.